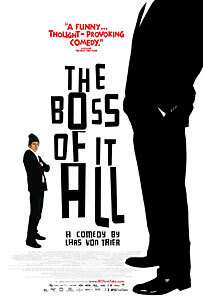 The Boss Of It All (Direktøren for det hele) (Director: Lars von Trier, Denmark, 2006): After a string of serious and political films, Danish bad boy Lars von Trier has directed what he describes as a “harmless” comedy. Ravn, the owner of an IT firm, is interested in selling his company to an Icelandic businessman (a clever cameo by Icelandic director Fridrik Thor Fridriksson), but for the past ten years has pretended that the actual owner (“the boss of it all”) lives in America. It’s a ruse that has allowed him to blame all the hard decisions on the absent owner and take all the credit for any successes himself. But now he needs to produce this phantom in order to sign the deal, so he hires Kristoffer, an out-of-work actor whose self-importance is comically outsized compared to his talent. The hijinks begin when the company’s employees catch a glimpse of the man they’ve been waiting ten years to meet. At first, it’s easy to snow the employees with business doublespeak, but soon he finds out that Ravn has been sending emails to them over the years posing as “the boss of it all” and he’s neglected to tell Kristoffer who’s been told which lie. Within a few days, he’s been seduced by one employee, punched by another, and engaged to a third. As the scheme spirals out of both men’s control, the Icelanders return to seal the deal. At this point, Kristoffer discovers that Ravn’s plan is to sell the company, lay off all the employees, and profit from intellectual property that is not his to sell. Kristoffer’s initial solution threatens a form of infinite regress, with him blaming an absent “boss of the boss of it all.” Fortunately, he changes tactics, but just as we think he is going to show some moral courage, his actor’s ego overwhelms him. The film plays a bit like a Shakespearean comedy, in that director von Trier inserts himself into the film as narrator at several points, explaining what is coming up or what has just happened. And as a script, it’s clever and frequently hilarious. The actors are also well-chosen, with the two leads especially well-cast. The problem for me is that as a film, it isn’t visually interesting. At this point, I need to insert something about Automavision™, “a principle for shooting film (and recording the sound) developed with the intention of limiting human influence by inviting chance in from the cold and thus giving the work an ‘idealess’ surface free of the force of habit and aesthetics.” What this means is that after the cinematographer chooses a camera position and aperture, a computer algorithm offsets it so that each shot achieves a kind of randomness. In practice, it was slightly distracting, and certainly didn’t add anything to a visually uninspired film. There are a lot of jokes made in the film at the expense of the “artistic” theatre actor, but in this case, The Boss Of It All might just be more at home on an actual stage. UPDATE: The film opens in Toronto on July 13. This entry was posted in Theatrical Release and tagged denmark, iceland, larsvontrier, Theatrical Release. Bookmark the permalink.